Getting daylighting right means less energy for artificial lighting. Plus, daylighting has numerous wellness benefits. Efforts to provide energy efficiency and occupant wellness through lighting clearly dovetail. 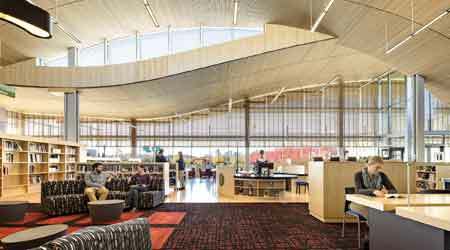 Both LEED and WELL place an emphasis on providing useful daylighting with reduced glare. To put an even finer point on it, both LEED and WELL use the exact same metrics and criteria for daylighting. Both standards promote quality lighting through a balance in brightness, reduced electric lighting glare, and high color-rendering properties. And both encourage access to views and “right to light” — in other words, that everyone has access to daylight. In version one of the WELL standard, credit 61 is actually termed “Right to Light,” and it requires 75 percent of the regularly occupied spaces to be within 25 feet of view windows. While the standards, and the broader goals, are in alignment in so many cases, there are fundamental conflicts between LEED and WELL. From an energy efficiency standpoint, providing the lowest appropriate light levels is a critical piece to minimizing energy consumption. However, wellness standards promote higher light levels to improve perception of the spaces and contribute to sleep/wake cycle maintenance. There are paths to resolve this conflict, particularly with the high efficiency of LED sources, but it is a conflict that needs to be addressed at the outset of the design efforts. Lighting’s fundamental shift toward LEDs has proved to be a disruptive change. LEDs solve or reduce the impact of many lighting issues, leaving space available to add an emphasis on energy efficiency and wellness into the decision‑making process. We are on the cusp of another fundamental shift — an inflection point that will change building design, construction, and operations to a more holistic method that should benefit everyone. Darcie Chinnis (dchinnis@hlblighting.com), PE, is a senior associate in the Denver office of HLB Lighting. She has been involved in the design and engineering of complex lighting and control systems for a wide range of project types.